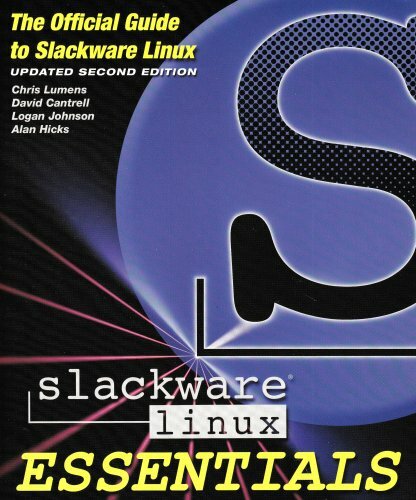 The manual for Slackware Linux. This book uses csh commands by default. Odd. 8 -- Holy crap, it opens with an introduction to 'man'!! This is what I needed all those years ago! 9 -- apropos searches through man page keywords. 11 -- Whoa, I get email support for installation because I bought the CD set? Neato. Totally unnecessary, but kindof cool. 15 -- Claims that the second install CD is a LiveCD, which is false. 20 -- Installation over a parallel port. Oldschool! 24 -- Claims 2x RAM for the swap partition. That's arguable. 52 -- Kernel 2.4.x compilation?! Crap, this is old!! Dammit, this book is May 2005. I thought it was _new_. Sigh. 54 -- Ok, 2.6.x compilation. Phew.